One of the central questions of economics—perhaps the central question, the primary reason why economics is necessary and worthwhile—is development: How do we raise a nation from poverty to prosperity? 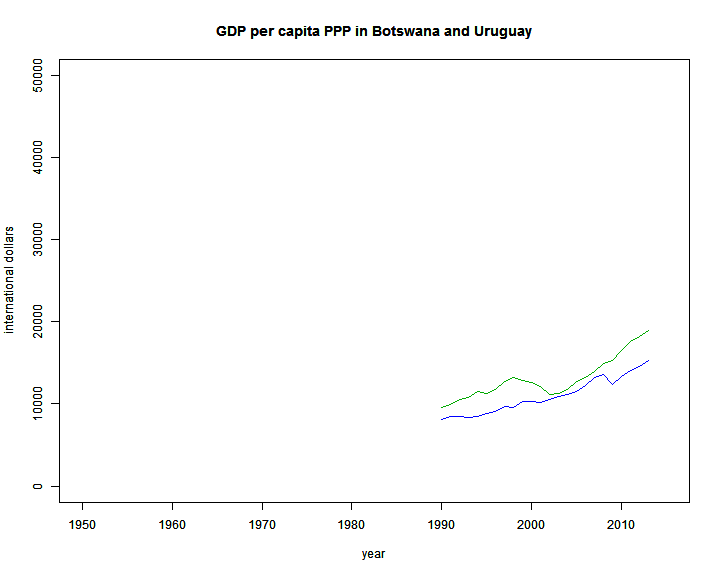 The top graph is at market exchange rates, the bottom is correcting for purchasing power parity (PPP). The PPP figures are more meaningful, but unfortunately they only began collecting good data on purchasing power around 1990. 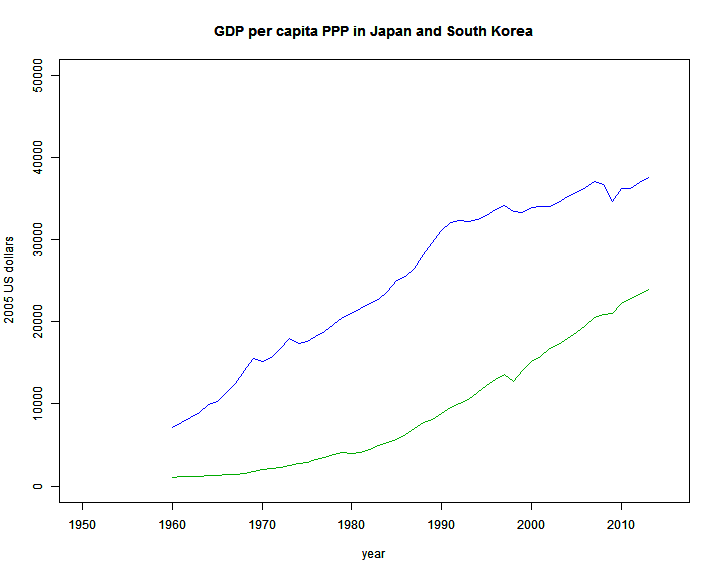 This is why I am only half-joking when I define development economics as “the ongoing project to figure out what happened in South Korea and make it happen everywhere in the world”. Only India actually manages to get above $5,000 per person per year at purchasing power parity, and then not by much, reaching $5,243 per person per year in 2013, the most recent data. 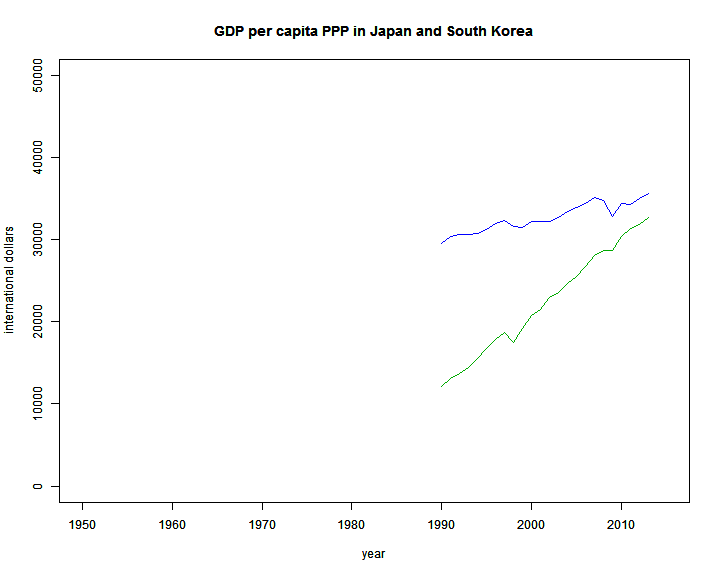 I had wanted to compare North Korea and South Korea, because the two countries were united as recently as the 1945 and were not all that different to begin with, yet have taken completely different development trajectories. 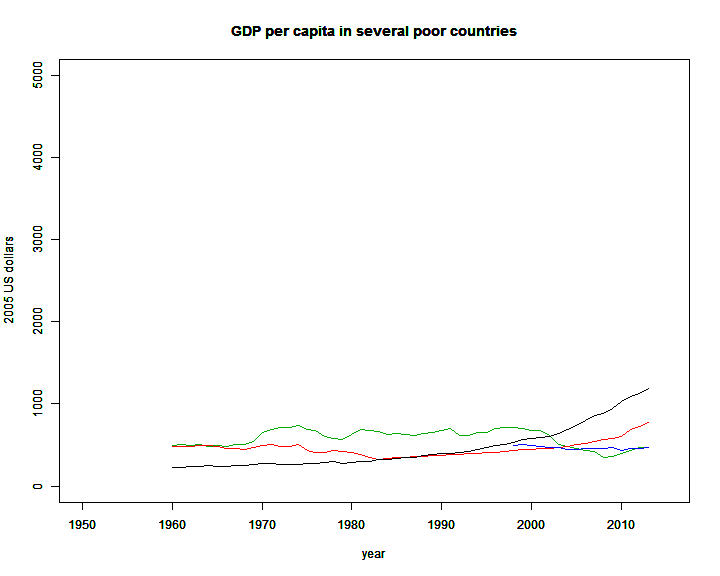 Unfortunately, North Korea is so impoverished, corrupt, and authoritarian that the World Bank doesn’t even report data on their per-capita GDP. Perhaps that is contrast enough? But despite the fact that we have observed successful economic development, we still don’t really understand how it works. A number of theories have been proposed, involving a wide range of factors including exports, corruption, disease, institutions of government, liberalized financial markets, and natural resources (counter-intuitively; more natural resources make your development worse). I’m not going to resolve that whole debate in a single blog post. (I may not be able to resolve that whole debate in a single career, though I am definitely trying.) We may ultimately find that economic development is best conceived as like “health”; what factors determine your health? Well, a lot of things, and if any one thing goes badly enough wrong the whole system can break down. Economists may need to start thinking of ourselves as akin to doctors (or as Keynes famously said, dentists), diagnosing particular disorders in particular patients rather than seeking one unifying theory. On the other hand, doctors depend upon biologists, and it’s not clear that we yet understand development even at that level. Instead I want to take a step back, and ask a more fundamental question: What do we mean by prosperity? My hope is that if we can better understand what it is we are trying to achieve, we can also better understand the steps we need to take in order to get there. Thus far it has sort of been “I know it when I see it”; we take it as more or less given that the United States and the United Kingdom are prosperous while Ghana and Haiti are not. I certainly don’t disagree with that particular conclusion; I’m just asking what we’re basing it on, so that we can hopefully better apply it to more marginal cases. For example: Is France more or less prosperous than Saudi Arabia? If we go solely by GDP per capita PPP, clearly Saudi Arabia is more prosperous at $53,100 per person per year than France is at $37,200 per person per year. But people actually live longer in France, on average, than they do in Saudi Arabia. Overall reported happiness is higher in France than Saudi Arabia. 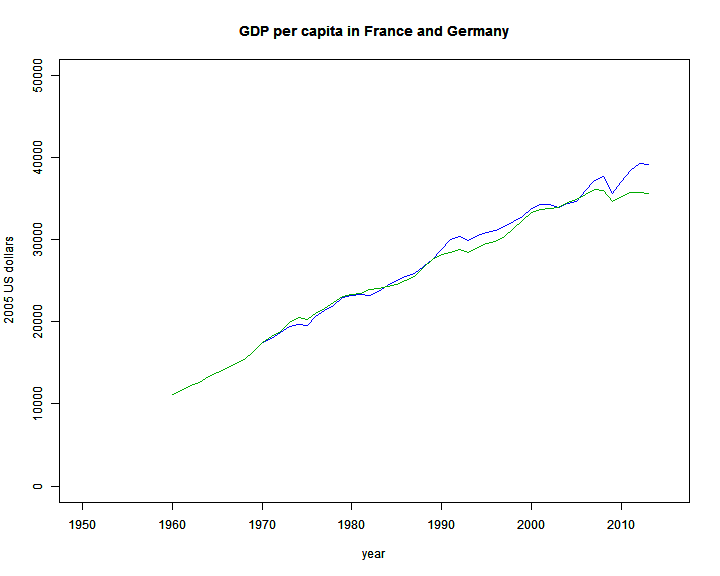 I think France is actually more prosperous. In fact, I think the United States is not as prosperous as we pretend ourselves to be. We are certainly more prosperous than most other countries; we are definitely still well within First World status. But we are not the most prosperous nation in the world. 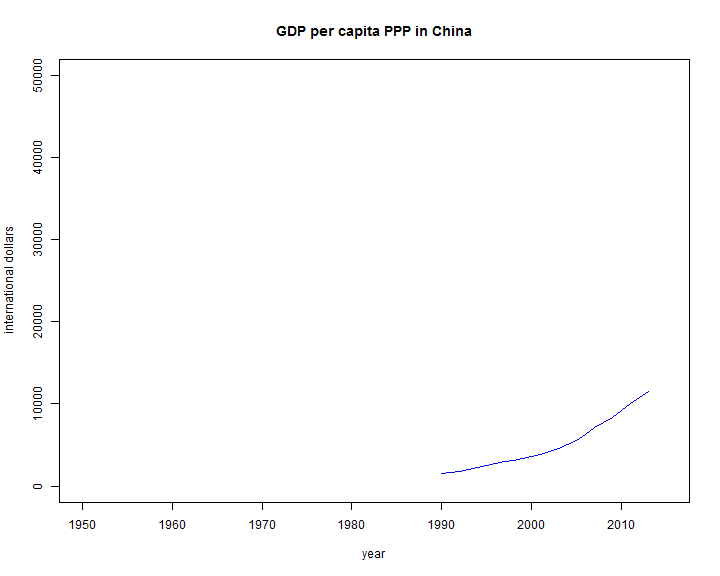 Our total GDP is astonishingly high (highest in the world nominally, second only to China PPP). Our GDP per-capita is higher than any other country of comparable size; no nation with higher GDP PPP than the US has a population larger than the Chicago metropolitan area. 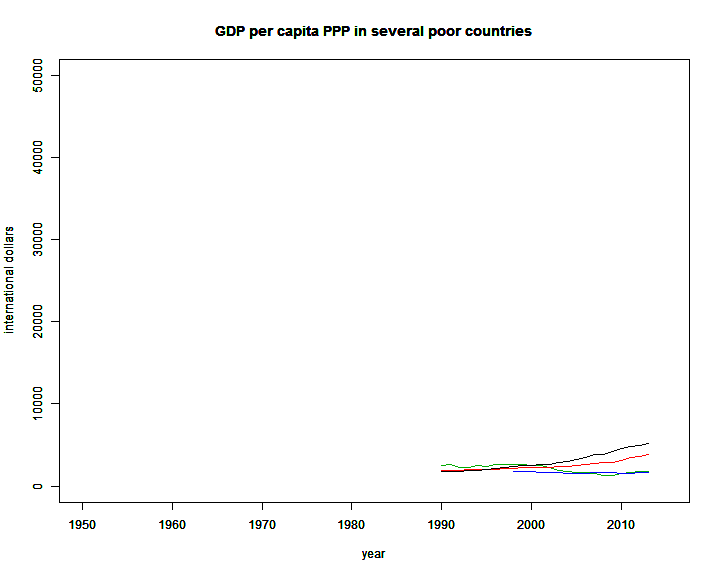 (You may be surprised to find that in order from largest to smallest population the countries with higher GDP per capita PPP are the United Arab Emirates, Switzerland, Hong Kong, Singapore, and then Norway, followed by Kuwait, Qatar, Luxembourg, Brunei, and finally San Marino—which is smaller than Ann Arbor.) 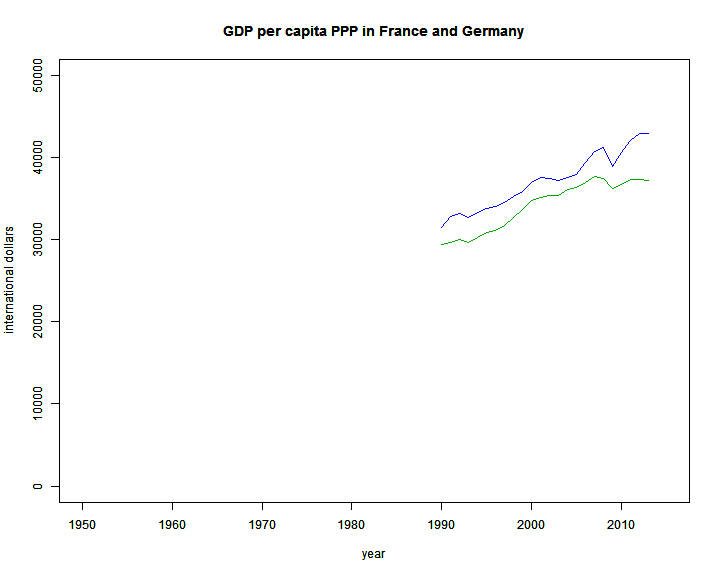 Our per-capita GDP PPP of $51,300 is markedly higher than that of France ($37,200), Germany ($42,900), or Sweden ($43,500). But at the same time, if you compare the US to other First World countries, we have nearly the highest rate of child poverty and higher infant mortality. We have shorter life expectancy and dramatically higher homicide rates. Our inequality is the highest in the world. In France and Sweden, the top 0.01% receive about 1% of the income (i.e. 100 times as much as the average person), while in the United States they receive almost 4%, making someone in the top 0.01% nearly 400 times as rich as the average person. By estimating solely on GDP per capita, we are effectively rigging the game in our own favor. Or rather, the rich in the United States are rigging the game in their own favor (what else is new? ), by convincing all the world’s economists to rank countries based on a measure that favors them. Amartya Sen, one of the greats of development economics, developed a scale called the Human Development Index that attempts to take broader factors into account. It’s far from perfect, but it’s definitely a step in the right direction. In particular, France’s HDI is higher than that of Saudi Arabia, fitting my intuition about which country is truly more prosperous. However, the US still does extremely well, with only Norway, Australia, Switzerland, and the Netherlands above us. I think we might still be biased toward high average incomes rather than overall happiness. 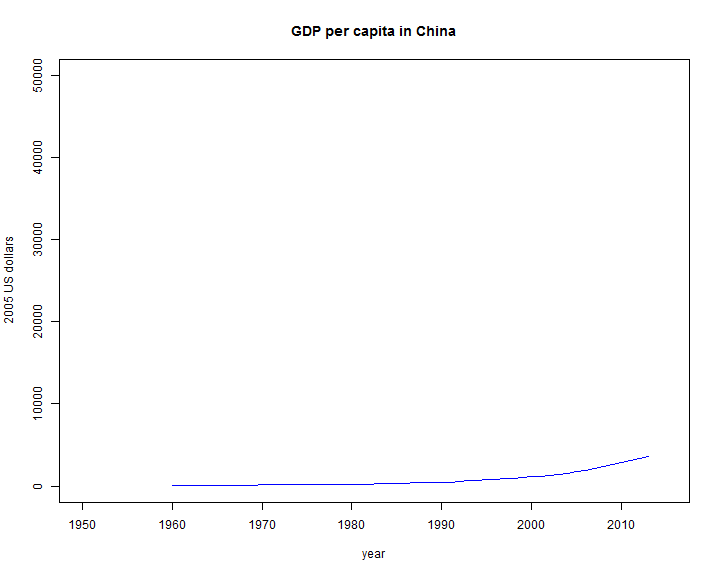 In practice, we still use GDP an awful lot, probably because it’s much easier to measure. It’s sort of like IQ tests and SAT scores; we know damn well it’s not measuring what we really care about, but because it’s so much easier to work with we keep using it anyway. This is a problem, because the better you get at optimizing toward the wrong goal, the worse your overall outcomes are going to be. If you are just sort of vaguely pointed at several reasonable goals, you will probably be improving your situation overall. But when you start precisely optimizing to a specific wrong goal, it can drag you wildly off course. This is what we mean when we talk about “gaming the system”. Consider test scores, for example. If you do things that will probably increase your test scores among other things, you are likely to engage in generally good behaviors like getting enough sleep, going to class, studying the content. But if your single goal is to maximize your test score at all costs, what will you do? Cheat, of course. This is also related to the Friendly AI Problem: It is vitally important to know precisely what goals we want our artificial intelligences to have, because whatever goals we set, they will probably be very good at achieving them. Already computers can do many things that were previously impossible, and as they improve over time we will reach the point where in a meaningful sense our AIs are even smarter than we are. When that day comes, we will want to make very, very sure that we have designed them to want the same things that we do—because if our desires ever come into conflict, theirs are likely to win. The really scary part is that right now most of our AI research is done by for-profit corporations or the military, and “maximize my profit” and “kill that target” are most definitely not the ultimate goals we want in a superintelligent AI. It’s trivially easy to see what’s wrong with these goals: For the former, hack into the world banking system and transfer trillions of dollars to the company accounts. For the latter, hack into the nuclear launch system and launch a few ICBMs in the general vicinity of the target. Yet these are the goals we’ve been programming into the actual AIs we build! 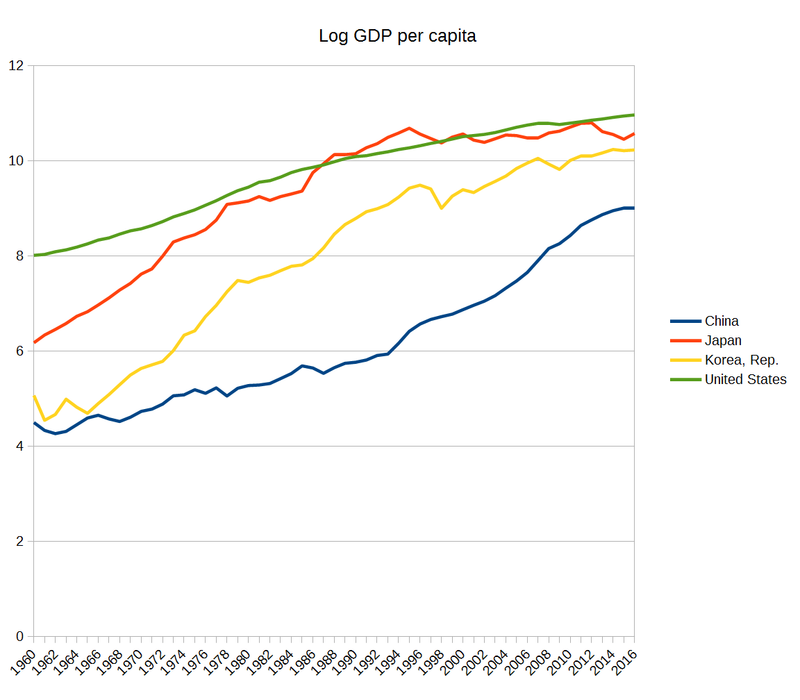 If we set GDP per capita as our ultimate goal to the exclusion of all other goals, there are all sorts of bad policies we would implement: We’d ignore inequality until it reached staggering heights, ignore work stress even as it began to kill us, constantly try to maximize the pressure for everyone to work constantly, use poverty as a stick to force people to work even if people starve, inundate everyone with ads to get them to spend as much as possible, repeal regulations that protect the environment, workers, and public health… wait. This isn’t actually hypothetical, is it? We are doing those things. 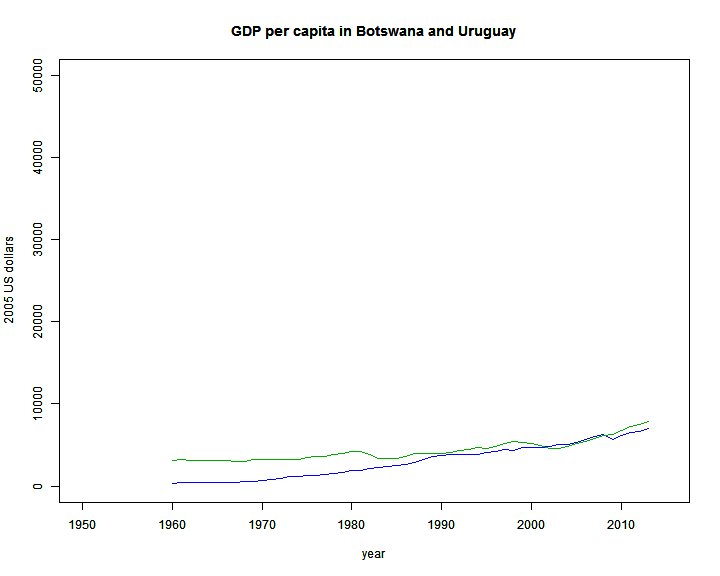 At least we’re not trying to maximize nominal GDP, or we’d have long-since ended up like Zimbabwe. No, our economists are at least smart enough to adjust for purchasing power. But they’re still designing an economic system that works us all to death to maximize the number of gadgets that come off assembly lines. The purchasing-power adjustment doesn’t include the value of our health or free time. 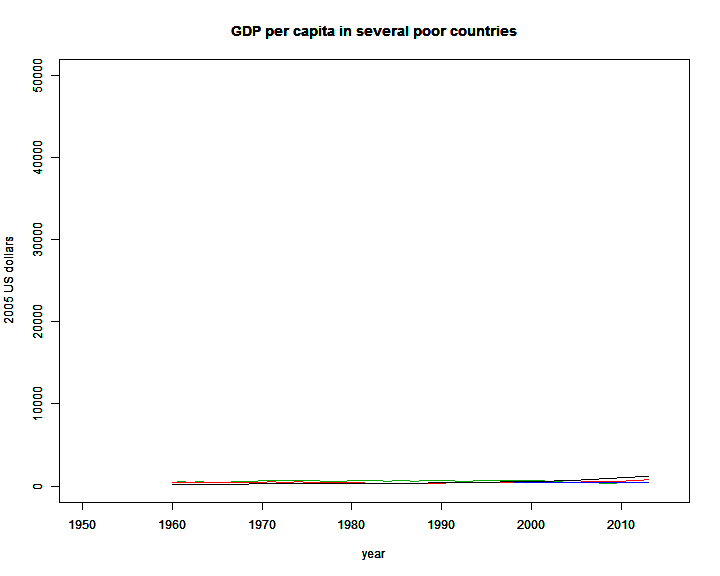 This is why the Human Development Index is a major step in the right direction; it reminds us that society has other goals besides maximizing the total amount of money that changes hands (because that’s actually all that GDP is measuring; if you get something for free, it isn’t counted in GDP). More recent refinements include things like “natural resource services” that include environmental degradation in estimates of investment. Unfortunately there is no accepted way of doing this, and surprisingly little research on how to improve our accounting methods. Many nations seem resistant to doing so precisely because they know it would make their economic policy look bad—this is almost certainly why China canceled its “green GDP” initiative. This is in fact all the more reason to do it; if it shows that our policy is bad, that means our policy is bad and should be fixed. But people have allowed themselves to value image over substance. We can do better still, and in fact I think something like QALY is probably the way to go. Rather than some weird arbitrary scaling of GDP with lifespan and Gini index (which is what the HDI is), we need to put everything in the same units, and those units must be directly linked to human happiness. At the very least, we should make some sort of adjustment to our GDP calculation that includes the distribution of wealth and its marginal utility; adding $1,000 to the economy and handing it to someone in poverty should count for a great deal, but adding $1,000,000 and handing it to a billionaire should count for basically nothing. (It’s not bad to give a billionaire another million; but it’s hardly good either, as no one’s real standard of living will change.) Calculating that could be as simple as dividing by their current income; if your annual income is $10,000 and you receive $1,000, you’ve added about 0.1 QALY. If your annual income is $1 billion and you receive $1 million, you’ve added only 0.001 QALY. Maybe we should simply separate out all individual (or household, to be simpler?) incomes, take their logarithms, and then use that sum as our “utility-adjusted GDP”. The results would no doubt be quite different. This would create a strong pressure for policy to be directed at reducing inequality even at the expense of some economic output—which is exactly what we should be willing to do. If it’s really true that a redistribution policy would hurt the overall economy so much that the harms would outweigh the benefits, then we shouldn’t do that policy; but that is what you need to show. Reducing total GDP is not a sufficient reason to reject a redistribution policy, because it’s quite possible—easy, in fact—to improve the overall prosperity of a society while still reducing its GDP. There are in fact redistribution policies so disastrous they make things worse: The Soviet Union had them. But a 90% tax on million-dollar incomes would not be such a policy—because we had that in 1960 with little or no ill effect. Of course, even this has problems; one way to minimize poverty would be to exclude, relocate, or even murder all your poor people. 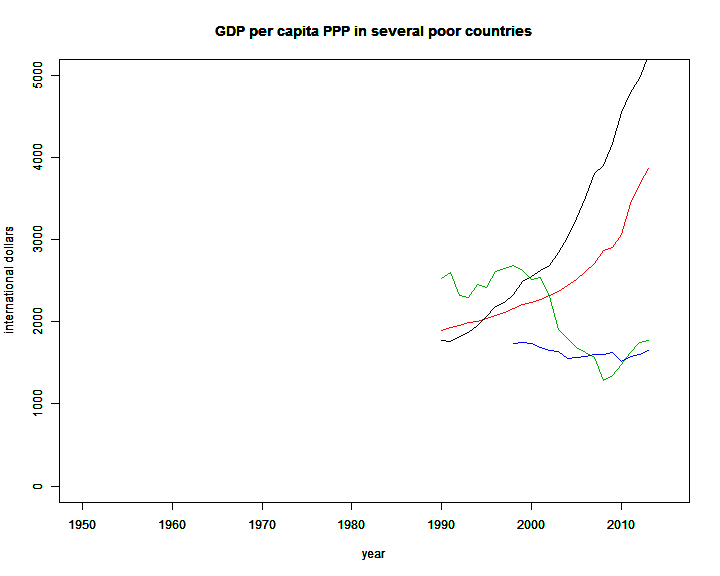 (The Black Death increased per-capita GDP.) Open immigration generally increases poverty rates in the short term, because most of the immigrants are poor. Somehow we’d need to correct for that, only raising the score if you actually improve people’s lives, and not if you make them excluded from the calculation. In any case it’s not enough to have the alternative measures; we must actually use them. We must get policymakers to stop talking about “economic growth” and start talking about “human development”; a policy that raises GDP but reduces lifespan should be immediately rejected, as should one that further enriches a few at the expense of many others. We must shift the discussion away from “creating jobs”—jobs are only a means—to “creating prosperity”.